Stained Glass News . Global Glass Studios . Warren Langley Australian Art Glass Master . Contemporary Glass Society Modern Sculptural Glass . Glass Art Society U.S based Sculptural Glass Resource . If you would like to learn the traditional skills of Stained Glass making for yourself , we would be happy to handle your enquiry . We can teach you how to make your own Leaded Glass Panel within just a few sessions . 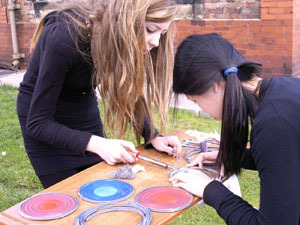 Courses can be tailored to suit your time commitment , giving you a skill for life . 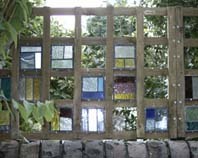 We also produce a range of glass products designed for outdoor use such as leaded Glass inserts for Trellis fencing . These provide a degree of privacy , whilst lighting up the Garden with a multitude of differing colours . These Panels can be made to order in any multiples , or come and look at our stock items , a sample can be posted out , should you wish . 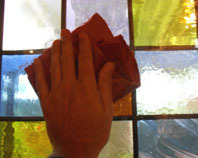 We can offer you impartial advice on how best to clean, maintain and care for any stained glass windows you may already have your home. If a repair is required we shall be able to give you the various options available and the best quote possible .